Google Maps provide an easy way to locate places throughout the world. It has been improving over the time with addition of more user friendly feature like zoom to specific area. Now while browsing hotel details from various places, you also view respective hotel price listing details. This can help you estimate budget and plan cost of your travel. 1. 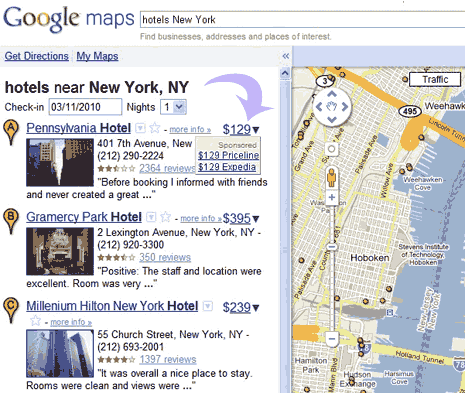 Goto maps.google.com & enter keyword to search for hotels in specific area. For example, you can search for Hotels New York. Also, you can click ‘more info’ next to any hotel listing to view more details of the hotel including location and price details (if available). For sure a handy addition while planning holiday stay, what say?